The 14" ThinkPad X1 Yoga Multi-Touch 2-in-1 Laptop from Lenovo is a system whose screen can rotate up to 360° to vary between laptop, tent, stand, and tablet mode. That means you can select a specific mode based on what you need to do and combine it with the keyboard, TouchPad Pen Pro, and/or the 10-point multi-touch screen to help maximize your productivity. 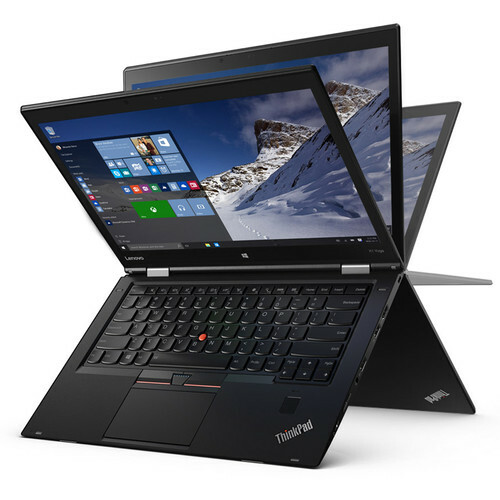 The X1 Yoga is powered by a 6th-generation (Skylake) 2.3 GHz Intel Core i5-6200U processor and 8GB of 1866 MHz LPDDR3 SDRAM, which allow you to run multiple applications simultaneously. Powered by an integrated Intel HD Graphics 520 processor, the 14" multi-touch IPS display supports touch functionality and features a Full HD resolution of 1920 x 1080. You'll also be able to output video to an external display using the Mini DisplayPort or HDMI port. For long term storage of your files, the X1 Yoga has a 256GB SSD. While the SSD may not have as high a capacity as a traditional hard drive, it contains no moving parts and offers faster data transfer speeds. Additionally, because it has no moving parts, it is more resistant to damage from bumps and drops and does not have any read or write heads that wear down the drive during operation. To add more storage capacity, you can insert your microSD card into the built-in card reader. If you want to add external peripherals, the X1 Yoga offers three USB 3.0 ports. Network connectivity is achieved using 802.11ac Wi-Fi, and Bluetooth 4.1 technology allows you to connect additional compatible peripherals. When a Wi-Fi signal is not available, the notebook can still access the Internet utilizing its onboard 4G LTE WWAN module and an optional data plan from a cellular provider. Other integrated features include a 720p webcam, dual array microphones, two stereo speakers, a fingerprint reader, and a backlit keyboard. The X1 Yoga is powered using the included 65W AC adapter and a 4-cell/52Wh lithium-ion polymer battery, which will last for up to 10 hours before recharging is required. Also included is a ThinkPad Pen Pro, which has 2048 levels of pressure sensitivity. The pen features onboard charging and provides you with a precise content-creation experience. The installed operating system is Windows 10 Pro (64-bit). IPS technology allows for vivid colors and nearly 180-degree viewing angles. You can rest assured knowing your data and hardware are safe, thanks to features such as TPM encryption, a fingerprint reader, and a Kensington lock. Box Dimensions (LxWxH) 18.5 x 11.8 x 3.1"